I hope this post helps to debunk one of the myths surrounding cosmetics in the 1950s. Women wore ALOT more colours than just red and pink. 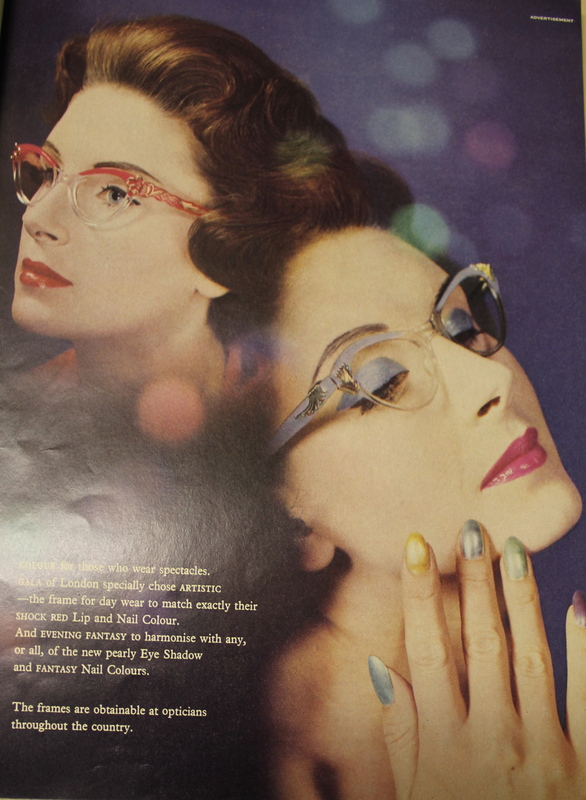 This is particularly true of nail polish as these amazing adverts from the 1950s prove. Look, pastels!!! I found these quite by mistake when doing some research for my dissertation. Let’s be honest who DOESN’T love cracking a vintage mystery??? 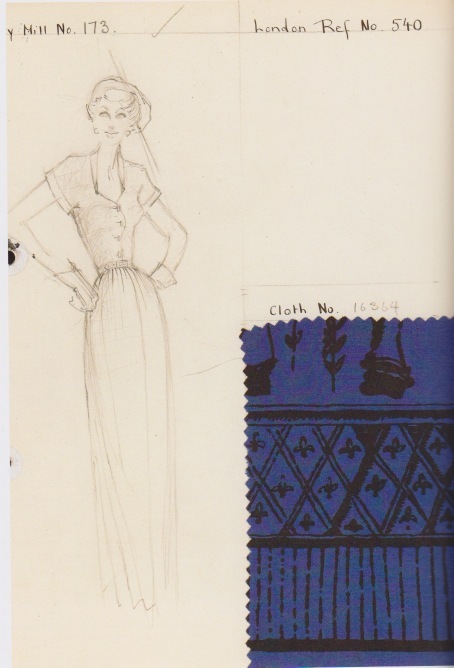 I love it when I uncover lost information on brands (this seems to be what my dissertation is all about at the moment…or rather the messy divorces of various 40s and 50s fashion bosses, but that is another story!) 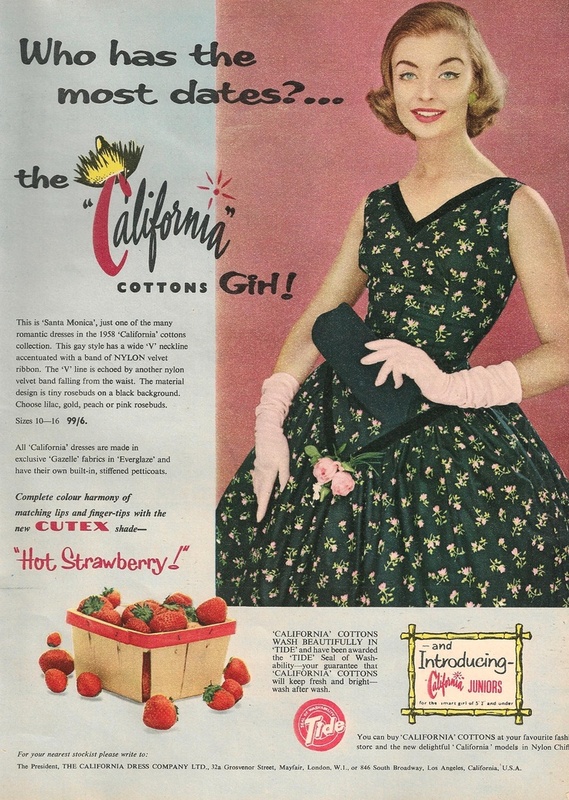 So imagine my delight last wednesday when I managed to discover (completely accidentally I will add) a key part of the history behind the collectible California cottons company. 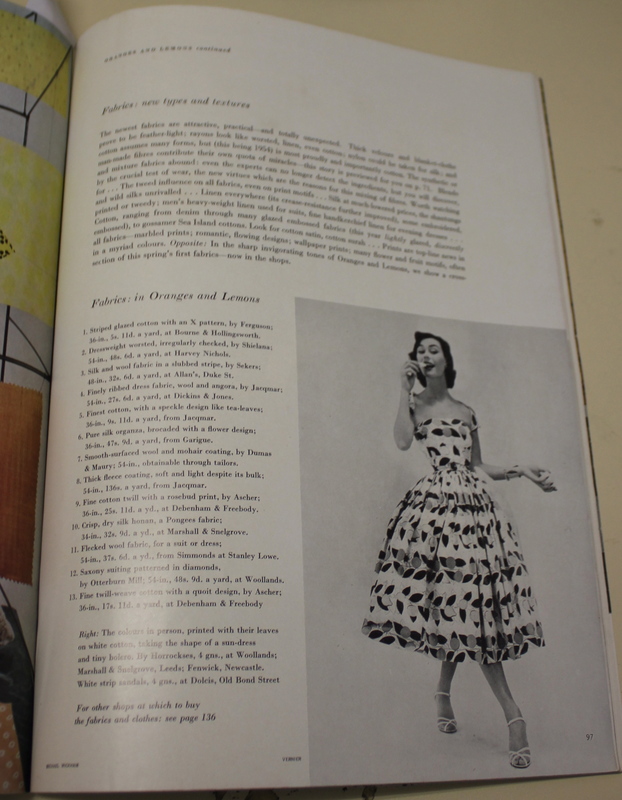 Last week I got down to a very important section of my research for my MA dissertation that involved looking at every copy of British Vogue from 1945 to 1960. I haven’t quite got through them all yet, but I have managed the bulk! My research turned up some interesting ideas/ adverts that will feed into my dissertation but also some fascinating images relating to Horrockses. 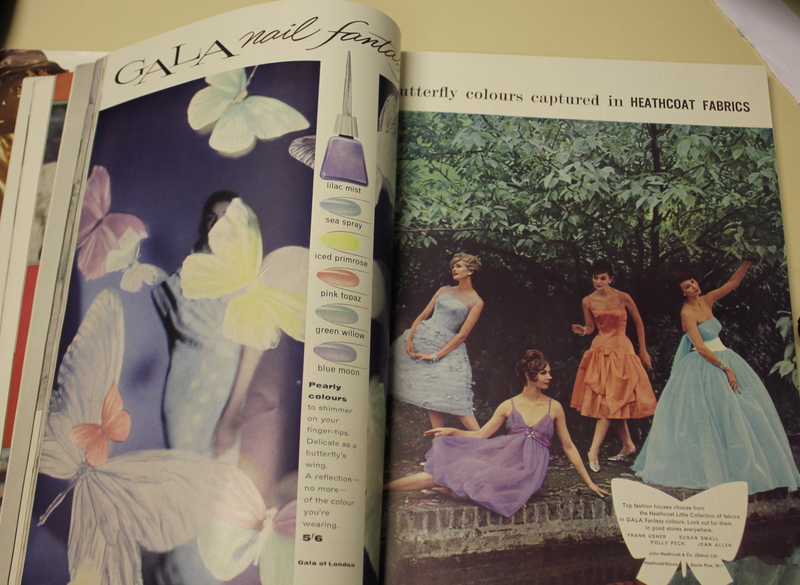 I’ve been fastidious with keeping a record of any dresses from my collection that were advertised in the magazine, but on this look through I turned up three images that relate to pieces I own. 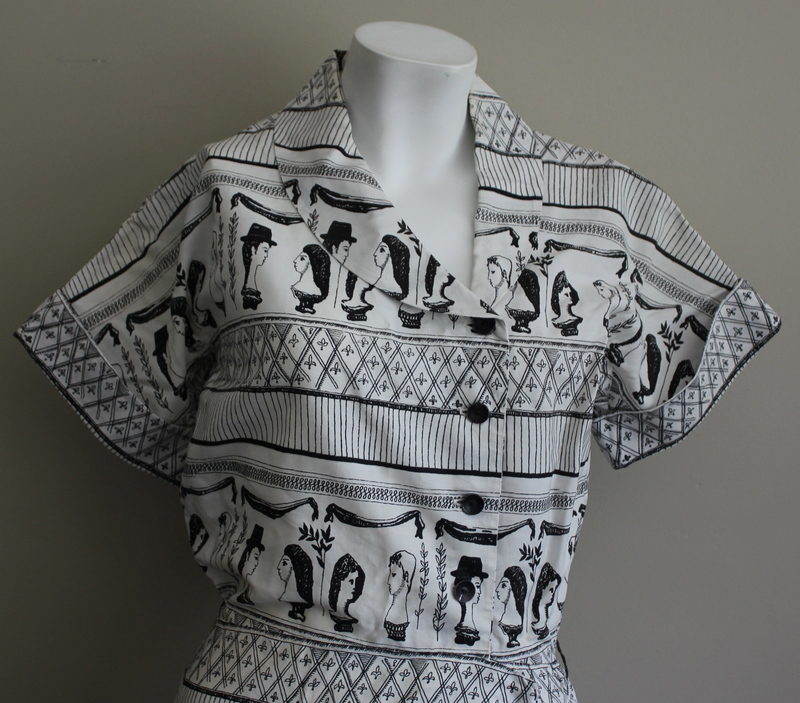 The caption reads as follows “Serene sightseer…gay, cool and appropriate all day in a red cotton print skirt, sleeveless black jersey, print scarf eith black reverse- wear it alternatively as a tiny shawl. 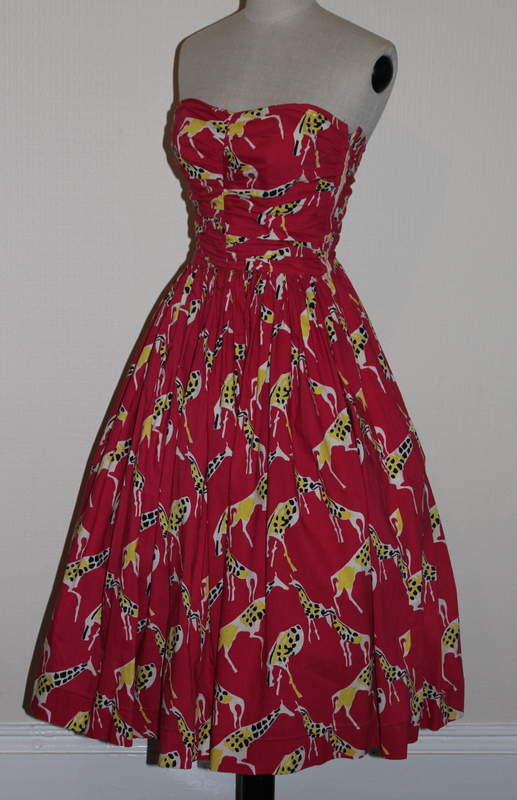 By Horrockses, £7 19s. 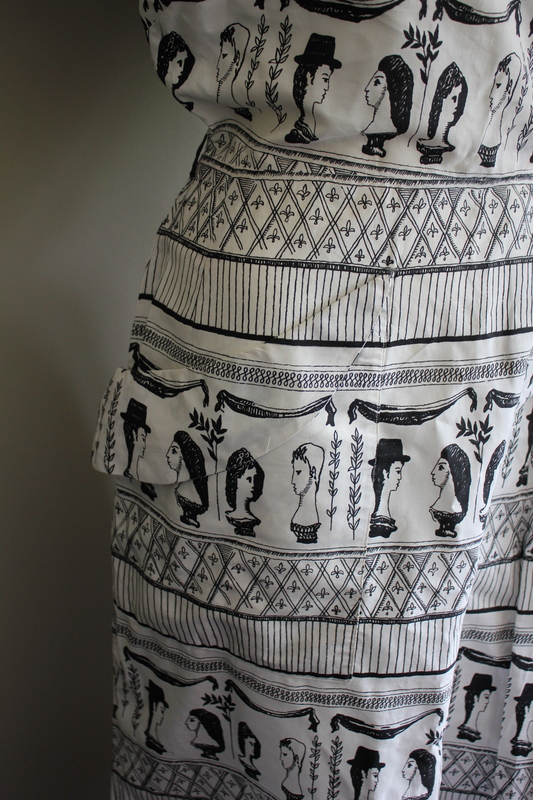 I’ve seen the skirt version of this print in green before, so I am assuming this is what the editorial relates to. 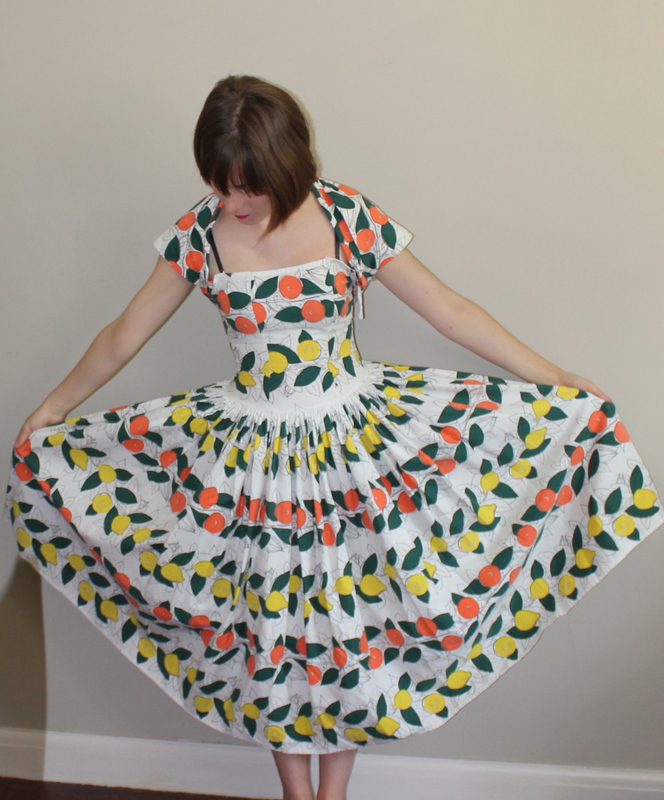 And here is the dress itself! 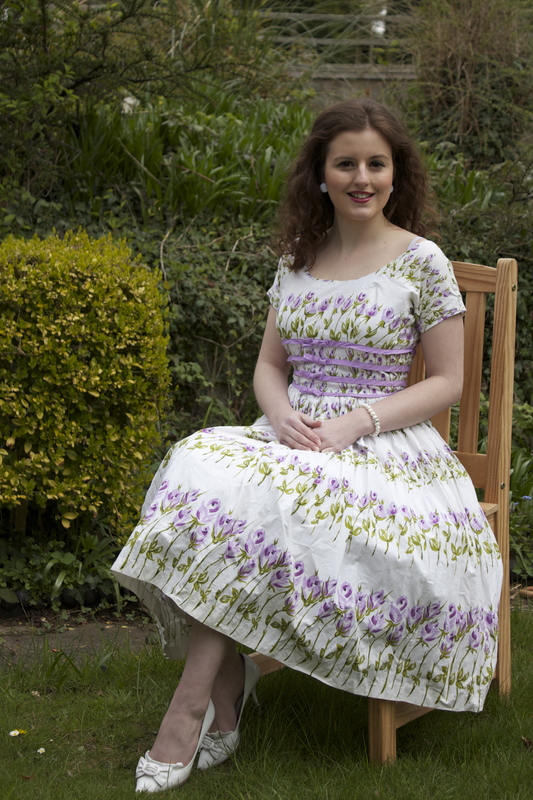 I will soon have some better pics of this dress (I had it photographed last week) but this is a quick snap of it I took before it was repaired. 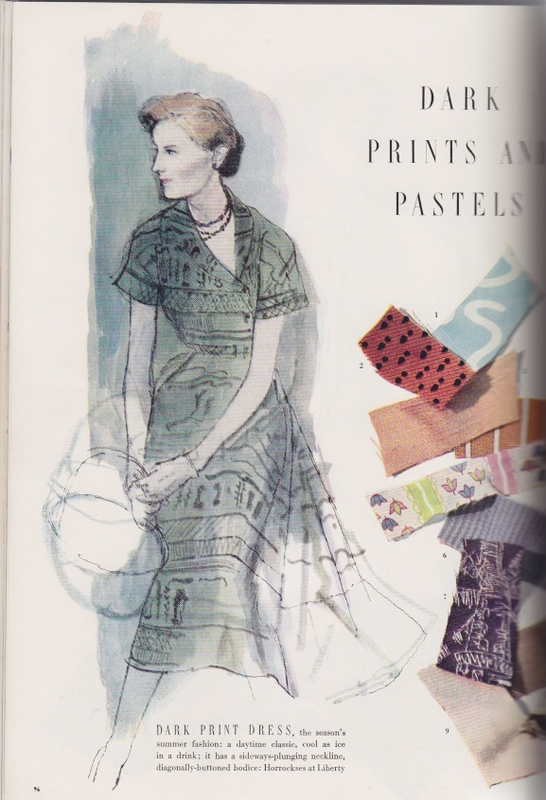 And here is another dress I turned up in Vogue. Here is the original editorial. 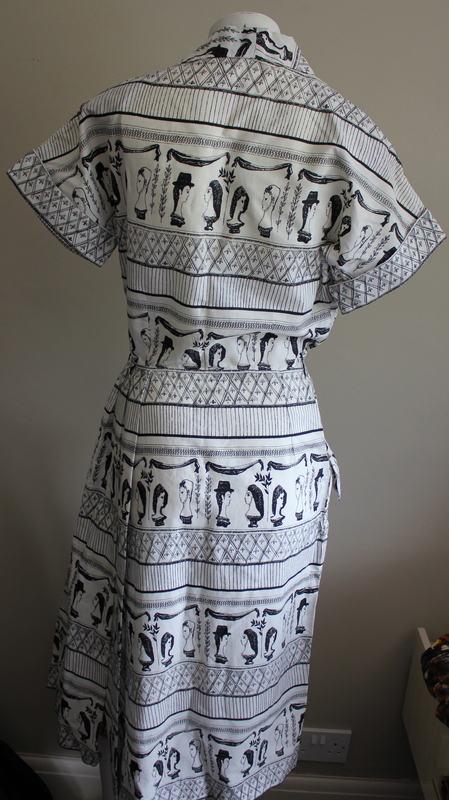 Here is the dress. 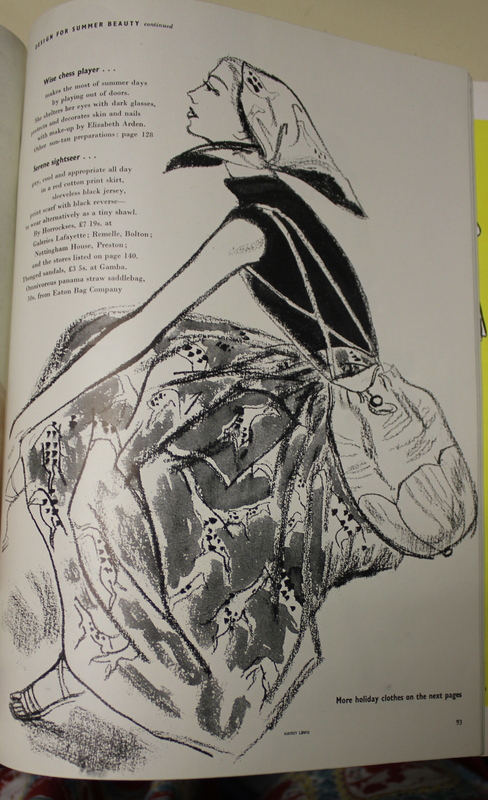 I think the print is probably by Graham Sutherland. 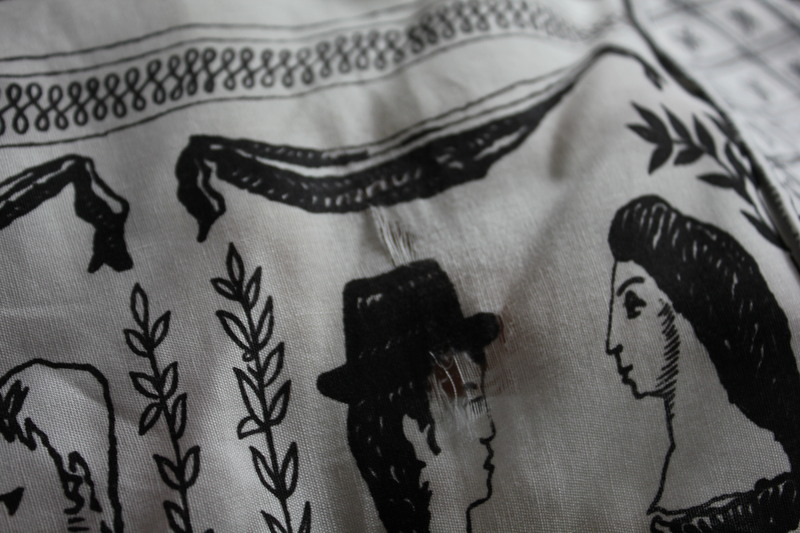 Sadly my example of this print has seen better days, the fabric under the arms is very thin, and perhaps beyond repair…if anyone thinks it can be tackled though do give me a shout. 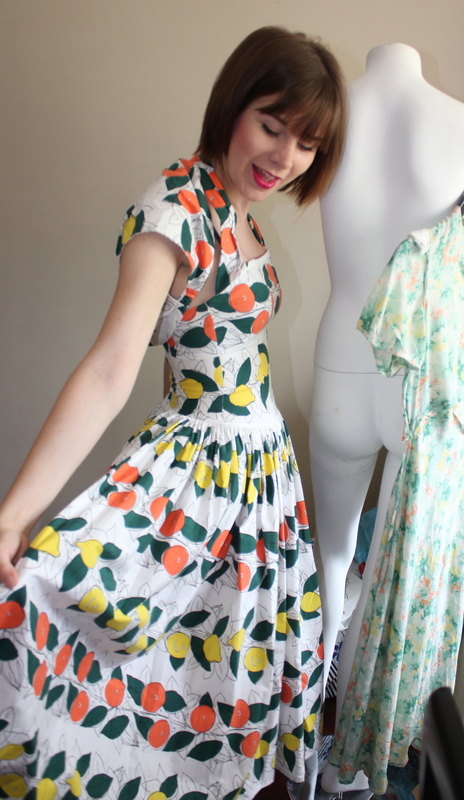 I’ve actually had this dress around 4 years now but have never shared it on the blog before owing to its poor condition. 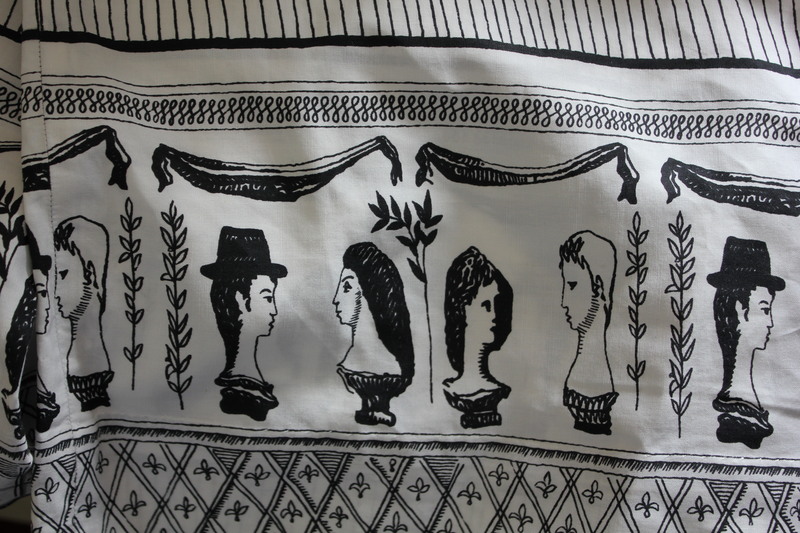 Interestingly you can see that the print also features in the Horrockses book, although you only see a tiny sliver of the fabric in the book, which does not even slightly convey how exciting the print is in reality. I think this whole design must have been an exclusive for Liberty because both the book and Vogue state it as an exclusive despite the two dress designs being slightly different. And finally do you remember my excitement after I purchased this number the other week? Well, I found this featured in Vogue too! (sorry about my bra straps in the second picture, eugh, pet hate). Here it is featured in february 1954. It was priced at 4gns, which for a Horrockses was actually very cheap (most were 6gns minimum) I have to admit that the construction of this one isn’t as good as many of my other Horrockses aree, which maybe accounts as to why the price was much lower.